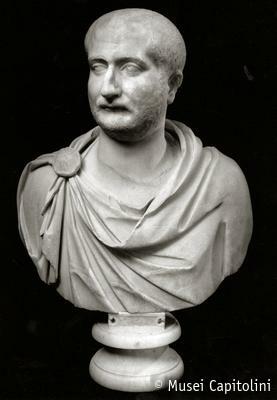 The portrait, set on a non-pertinent, though ancient bust, features a middle-aged man with the head briskly turned to left. The age of the man is suggested by the wrinkles crossing the forehead and running to either side of the mouth, as well as by the flabbiness of the face. The slanting eyes have iris and pupil incised and are surmounted by brushy eyebrows. The nose is hooked and the upper lip is markedly protruding. Hair and beard are rendered by fine chisel strokes. The head can be dated to the middle of the 3rd century AD. Formerly in the collection of Alessandro Albani, the bust was acquired for the Capitoline Museum in 1733. Before being moved to the actual location, the sculpture was displayed in the Salone of the Palazzo Nuovo.